Hasselnuts, an iPhone adapter for medium format cameras, has been successfully crowd-funded on Kickstarter. An iPhone adapter for medium format cameras has been successfully crowd-funded on Kickstarter. 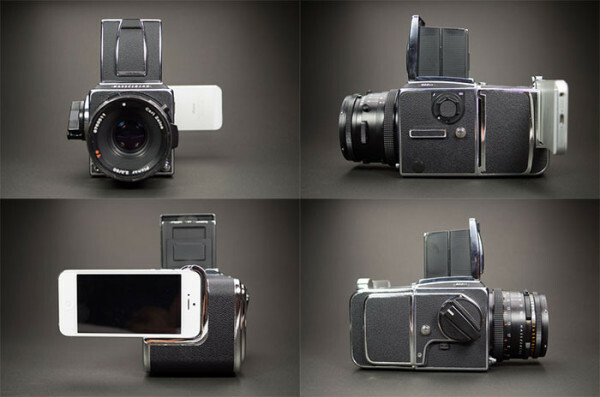 Hasselnuts is an iPhone-based “digital back” for Hasselblad V-system cameras that has raised three times its $10,000 goal in just three days. 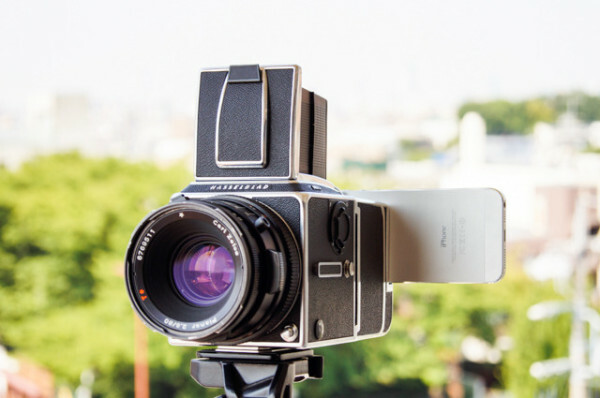 The device, designed for the iPhone 4S, 5, 5S and 5C, is developed by Ambivalent, a Japanese company founded by medium format enthusiast Daniel Jun Hoshino. Hasselnuts takes the place of a conventional film adapter or digital back, allowing photography using legacy Hasselblad bodies and lenses but the modern software interface and easy-sharing capabilities of the iPhone. “We want to revitalize the old Hasselblad cameras you have in the back of your closet,” says the campaign page. The system works by detecting the vibrations from the Hasselblad’s own shutter and triggering the iPhone camera’s shutter in response. Aperture is set on the lens itself, just like when using film. However, Iso-sensitivity and shutter speed will not be manually selectable, due to limitations of the iOS operating system. But the company hopes to “expand to other smartphones” in the future. Asked about flash capabilities (this is a lighting site after all) Jun Hoshino said it won’t work with external flash in the same way that a V-system camera normally does, however they are “working on” solutions including compatibility with the Bluetooth-controlled Nova flash, another crowd-funded gadget. He also hinted at “maybe, more surprise in the future”. Upon Ambivalent completing the Hasselnuts project (which has a slated shipping date of February 2014), we can possibly look forward to Rollei, Pentax and Polaroid versions. For more information, visit badasscameras.com or the Kickstarter project page.